When Matthew Dehaemers makes his art, his point isn’t simply that it be beautiful — though his works do function on that level. 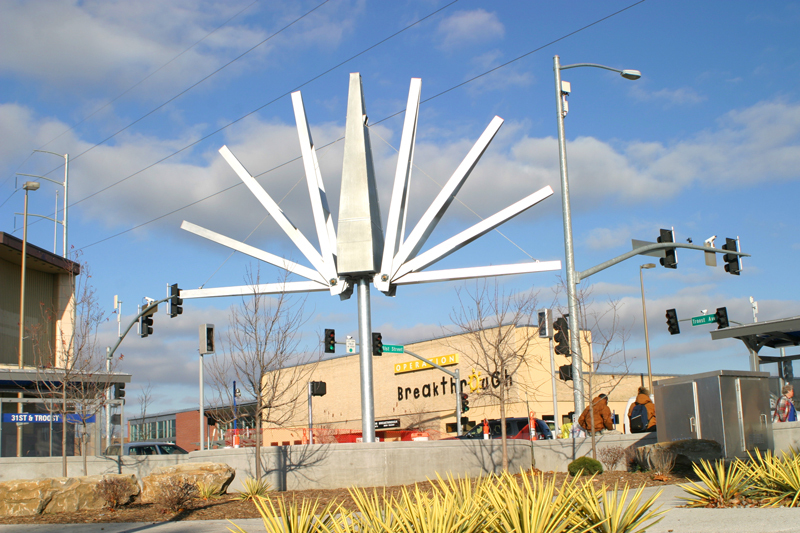 He means to connect the object to the place-ness of where it will be — as in “Catalyst,” for instance, his kinetic metal sculpture at 31st Street and Troost. The public art’s subtle mechanics and striking symmetry complement the medallions that Dehaemers embedded in the nearby sidewalk to commemorate the cultures and individuals who helped establish the Troost corridor, starting with the Osage Indians. That fixation on place and history has its roots in the artist’s ideas about family, identity, how generations pass stories down, and how those stories are chosen. Dehaemers’ family, transplanted from Belgium, has been in the Kansas City area since 1912. The subdivision where his family’s farm used to be — near what is now 67th Street and Quivira — is now called Tanglewood Estates. Charles Street is named for Dehaemers’ great-grandfather, Charles Dehaemers, who came through Ellis Island with his brother and his wife, Elisa. Know that much and you start to understand Re-Tread, Dehaemers’ first hometown solo exhibition. “I want to show people I’m not just ‘that public-art guy,'” Dehaemers tells me. We’re at his work space, part of the Studios Inc hive, a few days before the show’s opening. Large costume masks wait in one corner as if for Mardi Gras, but Dehaemers is too busy to take part this year in the usual 18th Street march from the Crossroads to the Jazz District. Re-Tread turns Dehaemers’ public-art instincts inward, allowing him in the process to demonstrate his draftsman skills, his printmaking background and his understanding of craft materials such as dowel rods and wooden reeds and paper. These more intimate studio practices underscore how personal Re-Tread feels. Dehaemers’ dad worked on the family farm, stooping to cut spear after spear of asparagus that would be sold at the City Market, and he lost his own father at age 9. Dehaemers’ grandfather was only 34 years old when he had a heart attack after changing a tire; his father went on to spend 40 years working the counter at an auto-parts salvage business, listening to orders come through by radio. Know these things, and you find more layers in Re-Tread’s series of rebuilt vehicles rescued from the junk heap, pieces of Dehaemers’ past intended to operate on a more universal level, too. We each have families, and most of us have more questions than answers about the generations preceding our appearance. At 41, Dehaemers is making memories with his own young children. Coincidentally, his family recently moved to a house less than a mile from the original family farm. Johnson County used to be a patchwork of small farms, a fact of the not-so-distant past that we don’t often recall as we drive through that increasingly developed part of the metro. A tire motif runs through Re-Tread, stemming in part from Dehaemers’ experience exploring the salvage yard when his dad eventually sold the business and its land. Dehaemers was wrapped up in graduate school at the time and says he regrets not better documenting the scene. The office alone, heaped with old Chilton auto-repair manuals, was for him an archeological site. Like other vanishing mom-and-pop businesses, its detritus was fast turning to relics. Dehaemers could see the decline just looking at his dad’s original 1960s Ford tow truck out back, buried in hundreds of discarded tires accumulated over four decades. Tires are clunky, heavy, dirty things, the anchors of safety during travel that, when worn out, become useless and cost money to get rid of. Dehaemers approaches tires as he did with “Point of Departure,” the ethereal, lacelike streetcar sculpture that hung over Central Street as part of 2003’s Avenue of the Arts: Lanternlike armatures of light wood are covered with translucent Japanese paper (kinwashi). What is durable, dirty and functional is retraced into something airy and delicate. Illuminated from within, a set of 4-foot monster-truck tires is attached to a towering frame topped by a double-faced truck body with glowing headlights. It is “painted” in dirt and drives forward and back, toward the past and into the future, with rootlike branches dangling from its chassis that, to me, represent the present. “I’m Trying to See It Both Ways” invites a 360-degree view of itself and the idea of conflicting thoughts. A smaller version, “Figuring It Out Together As We Go,” is tucked in a nearby corner. (Dehaemers points out the marriage of masculine and feminine ideas in making tough trucks out of lightweight materials, the kind of basic things that could be found in any child’s art box.) In addition to monster trucks and abstract constructions incorporating tires — a standout being “Descendants,” a 6-foot paper tire attached by a wooden axle to a much smaller one, a direct statement about family ties — six large drawings echo the three-dimensional work perfectly by giving iterations of the family narrative. Also on a wall by itself is “I See You, I See Us, I See Them,” a woven-reed tire form encircling a mirror like chrome hubcap. Hanging from an I-beam in the vast gallery space is a giant wooden tire swing, “Navigating a Way,” and it’s the show’s multi sensory masterpiece. A planned holdover from the last Studios Inc group exhibition, it anchors Re-Tread because it’s big, yes, but mostly because it’s as moving emotionally as it is literally. Step into it and take a seat. It may at first feel like a kids ride at a Renaissance festival, but as you listen to the words bouncing out of four hidden speakers and start to equate the swaying with the rhythms of a trans-Atlantic steamer at sea, you’ll hear Dehaemers’ family story unfold and feel it envelop you. It works best with a partner. Dehaemers told his story to local poet and artist José Faus, who crafted a nine-stanza work called “El Camino Rests in the Tanglewood.” KC Repertory Theatre audio engineer Jeffrey Keirsey split Faus’ animated reading into separate channels, then incorporated various ambient sounds, such as radio shows, the running engine of Dehaemers’ dad’s old pickup truck, and historic recordings from Ellis Island. The poem is written on the floor around the work in a large spiral in yellow, in the style of the grease pencil used to mark car windows. When the gallery isn’t echoing with a dozen opening-night conversations, you can hear the poem as you view any of the works. The sound keeps planting reminders of what starts to feel like your own story. Walk the space awhile and you hear the ending more than once: The whistle of a train/That arcs back on itself/Over and over again. The words and the art, poignant and persuasive, re-tread your sense of time.